The Greater New York Stereo Co. actually sold views from offices in both New York and Chicago during the 1890’s and early 1900’s. Most of the images were sold through New York photographer E. M. Brown, while some were credited to another New York photographer, Alfred S. Campbell. The company had uncommon, yet diverse scenery including series of the Pan-American Expo., hunting views of Michigan and various genre sets. Their view numbering extended as high as #7,000, and over 1,000 views are known. The only two views labeled Yellowstone to surface so far, look to be errors. The photos do not appear to actually be in the park. It is not known if this publisher actually has any true Yellowstone views at all. 786-b. Obsidian Cliffs, Yellowstone Park. Series of 1901, by E. M. Brown. 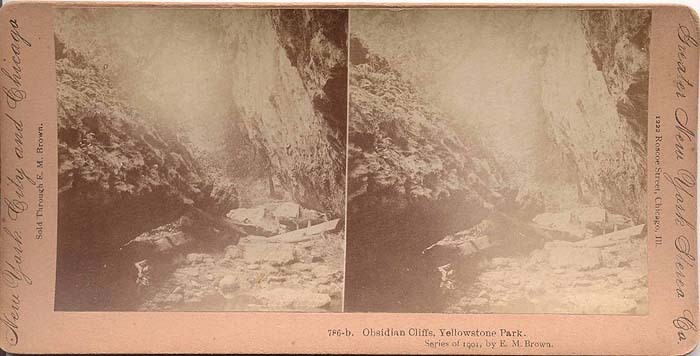 One of Brown’s mysterious Yellowstone stereoviews. The image does not appear to be in Yellowstone at all. Another photo labeled "Old Maid’s Kitchen" also appears to be mistakenly captioned.